San Francisco is a city of diverse neighborhoods, each with its own distinct personality. Led by your knowledgeable guide, you will visit amazing landmarks like Alamo Square, Nopa, the Panhandle and Golden Gate Park, Haight-Ashbury, Lower Haight, the Castro, the Mission, SoMa, Civic Center, and Hayes Valley. 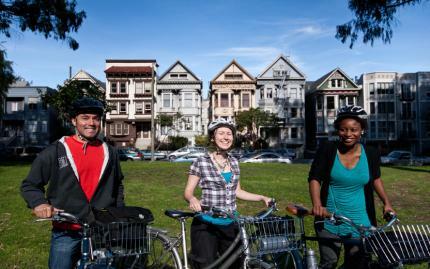 Wiggle through many of the city's diverse neighborhoods and get to know the identity of each. Midway through your ride, you'll stop for a delicious lunch at a local cafe, taqueria, or food truck. After all, you can't really understand a city's culture until you get a good meal. 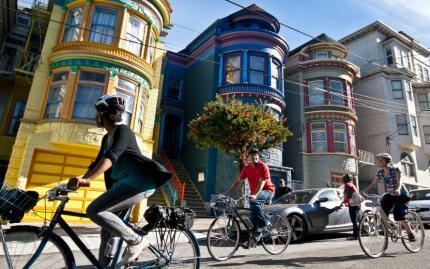 Embark on this exploration by bike and see for yourself how there's no better way to find out just what makes San Francisco so unique. Note: There is a 2-person minimum for this booking. Lunch is not included in the tour price. Around 12 miles will be covered during this tour. Before booking please make sure that all participants are physically capable of enjoying this type of activity. Please enter the heights of all riders in the "Special Requests" section so that you can be properly outfitted with a bike. Cancellation notice must be provided at least 48 hours in advance in order to receive a full refund or reschedule. Please note that if your tour is cancelled due to rain you will receive a full refund. Since weather patterns change so quickly in the Bay Area the decision for a tour to be cancelled will be made 1-2 hours before your tour begins. If the tour is cancelled you will be notified via call and/or text.